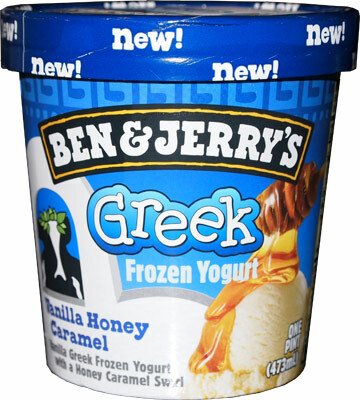 [2013-2014] Ben & Jerry's Greek Froyo line is expanding from 4 flavors to 7 flavors this year. Only one of the flavors has a catchy name, but more importantly, only one of the flavors really has a chance of winning me over after last year's "close but not quite" flavor options. 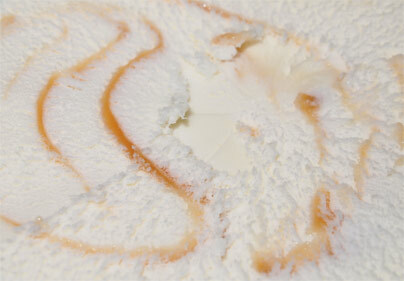 This is the new Ben & Jerry's Vanilla Honey Caramel flavor. 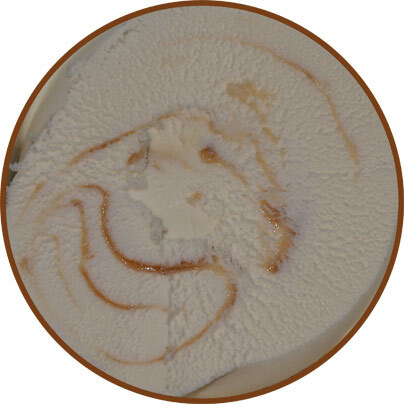 It's Vanilla Greek Frozen Yogurt with a Honey Caramel Swirl. I like vanilla, I like caramel, but honey can be hit or miss for me. The first thing I notice is that the greek tang is practically non-existent, and the texture? Well, it's nice. I get a little hit of a general yogurt texture, nothing major, just a little reminder of what this one isn't really ice cream, but nothing major. The flavor is playing it easy as well. The honey is mild, though I think it's strong enough to counteract the greek tang. There's definitely a subtle bottled honey taste, but it's happy going for a stroll rather than bowling me over. The weird thing here is that I'm not picking up the caramel at all at first. You know, this one is very reminiscent of like a light ben & jerry's vanilla ice cream. Ok, I mixed up the last little bit up out of curiosity to really get the swirl evenly spread out. It's funny because some of my tastebuds are finally picking up the caramel. Ofcourse some of my other tastes buds are saying "uggg, you brought out some of the greek tang buddy". Hehehehe, but seriously, this is another small step in Ben & Jerry's winning me over with this product line. On Second Scoop? Nope, none for you, well, none for me anyway. I never really intended to jump back into this one, rather I'll just let you know my wife quickly polished this one off. I think the key here is the laid back flavoring. It makes it an easy scooper that vacates your freezer quickly. As my first experience with their Greek froyo, I really enjoyed this one too. Like you, the other flavors don't stand a chance for me! Don't count out all of their new flavors! I bought B&J's Liz Lemon last night (because I am a stark, raving Tina Fey fanatic). The lavender blueberry swirl was very mild. I was hoping it would be stronger so I could see what the heck lavender tastes like. The lemon yogurt was really pleasant. It smells bright and citrusy without feeling like a bottle of Pinesol. The taste..again its mild. Its not an in-your-face lemon explosion. At least, there is no sign of a yogurt tang. Overall, this flavor is kind of wimpy. Not offensive, but not enough. @Beatrix, don't worry, I have a Liz Lemon review coming up in the near future! I am crazy coo-coo over this vanilla! I am a vanilla nut and the slightly salty caramel taste is a BIG hit for me! I wish I could buy this by the gallon!